The processing of auditory information requires neurons to fire at a rapid rate. Hair cells can, for example, respond to tones by oscillations of membrane potential at rates as high as many hundred times per second. This response rate firing conveys important information about intensity and frequency and so is maintained throughout the initial processing in the auditory brain stem. The first synapse through which response rate information must be accurately passed is between the inner hair cells and the auditory nerve. It is not surprising that evidence supports an excitatory amino acid transmitter and an ionotropic excitatory amino acid receptor at this synapse (Bledsoe et al.,’ 88; Altschuler et al.,’ 89), since this is one of the few known excitatory transmitter — receptor combinations capable of such speed. The next synapse in the ascending auditory pathway is obligatory, in the cochlear nucleus (CN). Firing rate information transfer is maintained at many auditory nerve — CN synapses, leading to the expectation that these synapses would also have an excitatory transmitter — receptor combination capable of considerable speed. 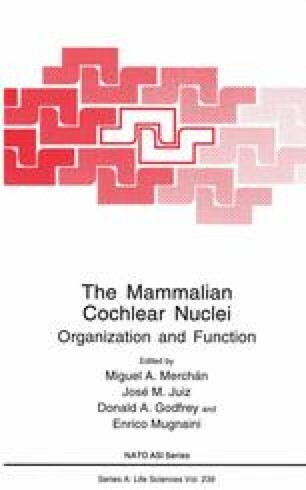 Much evidence suggests that an excitatory amino acid is the auditory nerve transmitter (chapter in this volume by Juiz et al. ; Wenthold,’ 91 and Caspary,’ 86) and that most CN projection neurons receive this input via an ionotropic excitatory amino acid receptor (see Wenthold et al. and Morest, chapters this volume), currently termed a glutamate receptor (GluR).